It was February 2012 when we made an icy ascent of Haystacks in the Lake District. 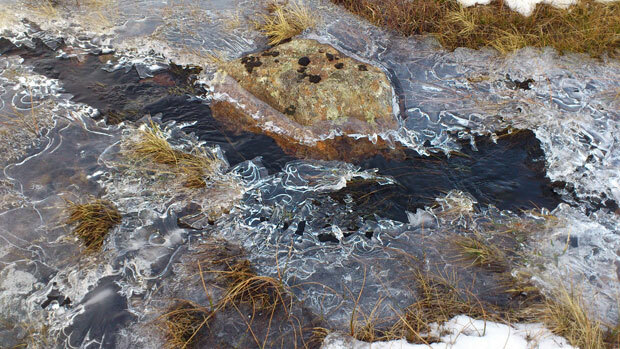 When we got to the top we found partially frozen water with some incredible ice patterns. This is just one small example of the kinds of creative patterns that are found in ice. God is an artist, actually He is The Artist! The master of all art, colour and creation !! Job 37.9-11 - The tempest comes out from its chamber, the cold from the driving winds. The breath of God produces ice, and the broad waters become frozen. He loads the clouds with moisture; he scatters his lightning through them. In Genesis 1.2 we find the 'Spirit of God'. The Hebrew word used here is 'ruach' which means 'breath'. The word is used through the Old Testament and in Job and is usually involved with God creating something. When we see ice, we are reminded that God has created this - it is from his breath that ice comes, that the waters freeze. God has set this world in motion, but Jesus is holding things together. Just as God is an artist in creating ice, so he is an artist in working to hold things together in a delicate balance. As we look at this picture of the ice, let's remember who God is - the creator of all things. Yes, much of creation is groaning and has been corrupted, but God's hand remains and we see a huge aspect of God's character and variation in the world he has created and sustains! Colossians 1.16-17 - For in him all things were created: things in heaven and on earth, visible and invisible, whether thrones or powers or rulers or authorities; all things have been created through him and for him. He is before all things, and in him all things hold together. The world that God has created is absolutely awesome. If you ask God to open your eyes when you're outside, he will show you his glory as promised in Romans 1.20 and Psalm 19.1. A Prayer: Lord, I pray that you would open my eyes to your glory. I want to see your glory and be inspired to be someone who reflects you and your glory! Thank you for your creation, thank you that you hold the world together by your Word. Lord, show your glory. Open our eyes. Open the eyes of the world. You turned water into wine, you turn water into ice. God, you alone are great! Amen!